The sun rises from the east, as it invariably does… The magnificent light of the first rays sneaks over the edge of the Tiras Mountains, setting the already warm red hues of the desert dunes on fire. ‘This must be what heaven looks like’, comments my travel partner as we gaze in wonder. A kaleidoscope of sparkling light. Soft pastel shades washed across the early morning sky. Worth every second spent on the long journey from the capital to the south. Not that the trip was tiresome in any way. On the contrary: it was an exciting road trip like few others, dotted with both beautiful and peculiar sights, an abundance of tourist attractions, coffee stops and nature reserves. After a trip like that I am almost convinced that we found a road straight to heaven. We swapped velocity for leisure as we rambled on to the deep south. The platitude about the journey being the destination rings true with the C27. As you depart from Namibia’s capital, an exciting road trip awaits! On your way from Windhoek to the C27, stop in Namib-Naukluft National Park. Explore the Naukluft Mountains by foot. Both the adventurer and the leisure-seeker are catered for with a choice of hiking trails matching different fitness levels. Discover the animals and the botanical treasures that thrive in this semi-desert savannah. Cool down in natural rock pools found all over the area. If hiking is not your cup of tea, gear up your 4×4 for an array of adventure trails, such as the Naukluft 4×4 Trail. It is the most difficult of its kind in Namibia and reputed to be the most difficult unguided 4×4 trail in the world. After the adventure, pitch your tent at NWR’s Naukluft Camp right next to the riverbed or opt for one of the lovely chalets. As you make your way to the C27 you will come to Sesriem, the gateway to the Sossusvlei section of the Namib-Naukluft National Park. Walk in the echoing depths of the Sesriem Canyon, which is about 1 km long and 30 metres deep, carved into the rock by the Tsauchab River. Spend the night at the scenic Sesriem Campsite. Nothing takes your breath away like the incredible landscape of Sossusvlei, a large ephemeral pan amid red sand dunes. Climb to the top of the world’s highest dunes (up to 325 m) goes hand in hand with a trip to Deadvlei, the neighbouring pan known for its petrified camel-thorn trees that dried up nearly a thousand years ago when the Tsauchab River changed its course due to shifting dunes. The area’s pans and towering mountains form part of the Namib Sand Sea, proclaimed as Namibia’s first Natural World Heritage Site in 2012. According to UNESCO, it covers an area of over three million hectares and a buffer zone of 899,500 hectares. Take a scenic flight or float along in a hot air balloon above this impressive site composed of two dune systems, an ancient semi-consolidated one overlain by a younger active one. There is a plenitude of lodges in the area to rest your head at night. Sossusvlei Lodge boasts a sparkling pool, a bar, sundowner deck, beer garden and an al fresco terrace where you can enjoy exquisite food and award-winning wines. All of that while savouring magnificent views of the floodlit waterhole. Other lodges of the same group, the Taleni Africa Collection, conveniently located in this area are Desert Camp and Desert Quiver Camp. Or simply get in touch with yourself as you sit at a campfire at Sossus Oasis Campsite. Find activities that suit your preferences. Whether you are seeking the thrill of a lifetime or something more leisurely, Sossusvlei Activity Centre organises excursions to Sossusvlei and Deadvlei, hot air ballooning, helicopter flights, scenic flights and much more. The NamibRand Nature Reserve is one of the largest private nature reserves in the world. Glide in the wind over the world’s oldest desert with Namib Sky Balloon Safaris, the base camp is situated on the C27. The company holds an exclusive concession to fly in this area and will undoubtedly wow you with the most spectacular sights. Travelling in a group with family or friends? Soothe your soul at NamibRand Family Hideout. The eco-friendly house is fully equipped for self- catering and can accommodate up to 10 people in four bedrooms. Take along your hiking boots and mountain bikes for hours of outdoor fun. So pack your car, load a fresh SD card into your camera and set off on an amazing journey down Namibia’s southern gravel paths. A host of roads leads to the C27 like tributaries to a great river. Veer off the beaten path when you can, the greatest adventures can always be found in the most unlikely places. And when you reach the red-dunes heaven, take a breath and let it seep in… you have arrived at your destination. You will not easily go thirsty or hungry in the Namib Desert. Betta Campsite is a charming stopover where three roads meet: the C27, D826 and D831. Take time for coffee and cake and stock up at the small, though well-equipped shop. Perhaps you even decide to stay the night. Driving from Maltahöhe en route to Helmeringhausen, make a well-deserved stop at Lisbon Roadhouse. Enjoy refreshments and stock up on fresh farm produce. Helmeringhausen Hotel prides itself on making the best apple cake in Namibia. We agree that it is absolutely scrumptious. The hotel also offers light meals for the hungry traveller. 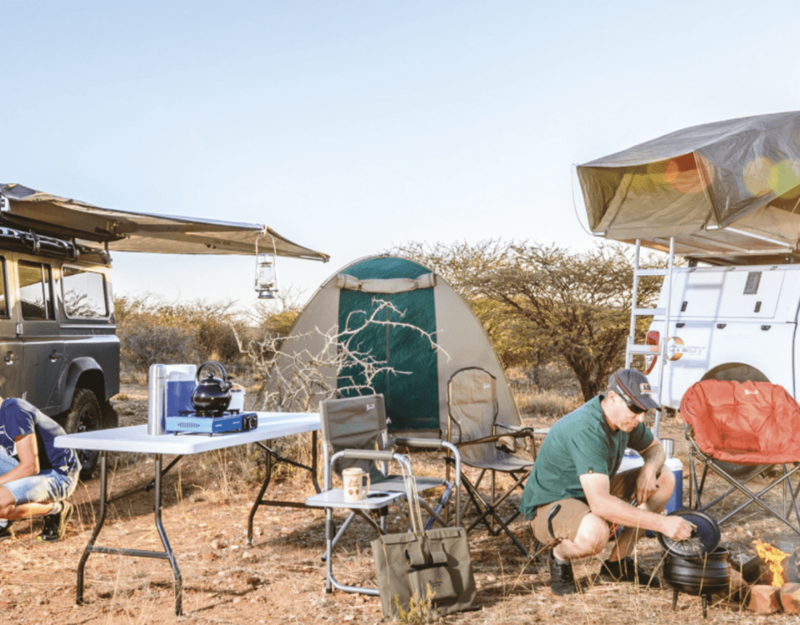 Pack your camera and snap away at the 33,000-hectare reserve known as a photographer’s paradise where wildlife and the environment are the first priority. It strikes the perfect balance between conservation and tourism and offers tourists an unparalleled experience. Educate yourself on conservation while walking among cheetahs. This is the exact same spot that Angelina Jolie visited in June 2017. Capture great action shots of the cheetahs by joining a guided cheetah feeding session. If you are coming from the north, the C19 from Solitaire will lead you onto the C27. On your way, stop at McGregor Bakery where the apple crumble is nothing short of enticing. What is the story behind the odd-looking windmill halfway between Lüderitz and Aus? A farmer, Siegfried Schnebel, tailor-made this 15 m windmill to withstand strong winds while enabling him to make the most of the rich underground water veins. to the historic Duwisib Castle, constructed by the legendary Baron von Wolf for his wife in 1909. Visit the castle’s museum and stay the night for an exclusive experience. Namtib Desert Lodge is nearby on the D707 – a worthwhile stop for any hiker, with breathtaking views of the Tiras Mountains. This article first appeared in the Autumn 2018 edition of Travel News Namibia. Can one drive the C27 in a SUV (not 4×4) on ones own or is it recommended that one travels with at least another vehicle. What is the road condition like? Hi Eric, thanks for your message. Namibia is known for the good state of our roads, which means driving around the country with an SUV is not a problem. Thanks a lot for the fantastic blog post! I was hoping you might be able to answer a route related question for me. I’ve rented a Toyota Corolla, and I’m heading towards Sesriem from the South. C27 sounds like a fantastic road, but I noticed that there are some ‘D’ parts near Betta’s Camp which is a bit worrying. I’ve already travelled along the C13 and felt the car was adequate for the conditions. Is C27 (and the D part) any different, or should I avoid it until next time, and take C14 / C19 route instead? Thanks for the question! Namibia is known for the good condition of its roads, so you can rest assured that your Toyota Corolla will be adequate for your travels throughout the country. With the C27 specifically, at the time that the story was researched, which was the beginning of 2018, the roads were fine for an SUV. However, conditions could have changed since then.